I was reading some posts from the folks over at MGoBlog...he had some good links to reactions of the Rich Rodriguez hire from around the Big Ten. And while at first blush it may seem like knee-jerking Ohio State fans playing down the whole thing...there is some actual kind-hearted reaction to the RR hire. But as Brian put it...much of it is stupid. But its funny, because since this whole thing went down, I haven't really had time to think too much about it...mostly because work has been driving me nuts these past two weeks. But also because whats the point? Lloyd still has one game left. We still have one more chance to watch Henne, Hart, Long and the 07 seniors play one last game. I will say...now that the season is over and there has been a little time for everything to sink in...this senior class was maybe the most underachieving class in recent memory. So much hype each year, and so little to show for it. But thats another post for another time. Rodriguez won't coach a game for another 9 months. So much can change in that time. But even as a Michigan fan...I'm not totally thrilled yet. I do think that he has the potential for being a great coach, but the last thing I'm going to do is come on here and claim that Michigan is reborn and Bill Martin is a genius. 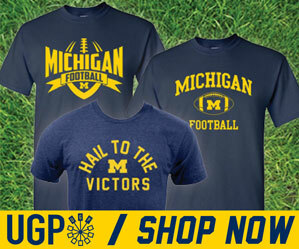 I mean, lets face it, my grandma would've been able to sell the Michigan program. Its not exactly the hardest job to fill. Putting together a long a list of worthy candidates probably didn't take that long. And getting less than thrilling responses from those coaches would've been awkward...and telling. Only Martin knows. But I like RR so far though. And judging by the reaction of WVU fans to his leaving...well, first shock...then rage...and acceptance will likely follow soon, but that alone is a good gauge that Michigan got a keeper. If WVU fans didn't react the way they did...then I would've been sketchy. "A Yahoo! Sports investigation revealed that Big Ten referee Stephen Pamon, a crew chief who has worked for the conference since 1988, has a checkered history of bankruptcy, casino gambling, child abuse and allegations of sexual harassment."